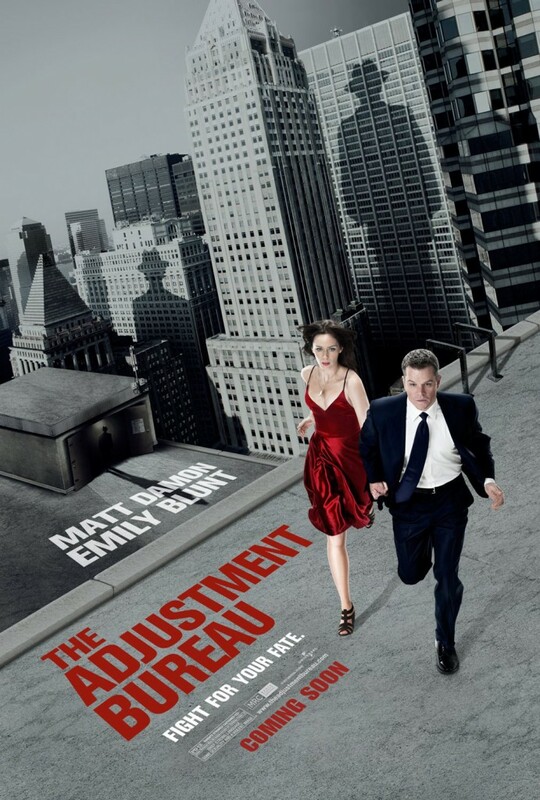 Brian Byrne reviews Inception wannabe movie The Adjustment Bureau, an entertaining if vapid affair. Politician David Norris (Matt Damon) is a front runner in the upcoming election for the United States Senate. Once praised for being one of the youngest ever candidates, Norris’s campaign goes the way of Fianna Fáil when a childish prank of his hits the papers. Norris loses the election, but on the night of his concession speech he happens upon a woman in a bathroom which will change his life for, you guessed it, ever. Norris finds dancer Elise (Emily Blunt) immediately captivating, but what he doesn’t know is that their relationship, if they are to ever have one, is doomed. Here’s the good news: director George Nolfi must be a trained carpenter, because when it comes to Damon and Blunt, he pretty much hit the nail on the head. The chemistry between these two is so good it could only have happened by mistake. That, or first timer Nolfi is more talented than I gave him credit for. The bad comprises pretty much everything else. The Adjustment Bureau is made up of a group of radicals who go around ensuring things go according to ‘The Plan’. In the case of David and Elise, The Plan is to keep them apart. If the two become an item, David will never succeed in politics and Elise’s destiny of becoming a world-renowned dancer will never be fulfilled. David, however, decides to ignore all of this and fight off the group at every turn, all in the name of new found love. Aww. I wasn’t surprised to learn that The Adjustment Bureau is based on a short story. The idea, while admittedly fun, isn’t meaty enough to handle the conversion to screen. The result isn’t a proper sci-fi movie, but rather a “light” version that everyday cinema-goers can enjoy. Not only is the idea too sparse to handle the full 98 minutes of run time, but many elements of the plot are simply too ridiculous to believe. Now, I know sci-fi isn’t believable by its intent, but when you give top hats the power to open teleporting doorways you’re going to invite some questions about the reasoning behind it, which of course leads way to the plot holes. If these hats give The Bureau the power to chase Norris through these doorways, why doesn’t Norris find some way to steal them? More importantly, if The Adjustment Bureau has the power to do all they say they can, how come they can’t get Norris to spill a cup of coffee on himself? How come they fail time and time again to keep him and Elise apart, despite their apparent brilliance? It’s a shame to see such good actors put to such bad use. David and Elise are immediately and forever fathomable. Their relationship is so intriguing that it saves the movie, turning it from a downright silly excuse for a piece of cinematography to an enjoyable – and sometimes exciting – thrill ride. I am adamant that if the producers hadn’t scored them for the parts, there is no way this movie would be getting the critical acclaim it is currently enjoying. Many members of the Bureau – Harry (Anthony Mackie, Night Catches Us) and Thompson (Terence Stamp, Smallville) – are also spectacular in their role which adds further insult to injury. Ultimately, you’ll enjoy The Adjustment Bureau if firstly, you don’t watch many sci-fi movies or secondly, you’re a big fan of Matt Damon or Emily Blunt. If neither of these are the case, you’ll be haunted from start to finish by the nagging feeling that this is trying to be something it isn’t. It tries to be as intelligent as Inception but what we end up with is a good thriller-come-romance with a bit of sci-fi tacked on here and there. Oh, and one more thing: why the hell did they give the main character the same name as that jolly gay senator from the Seanad? ← The Express is hiring!